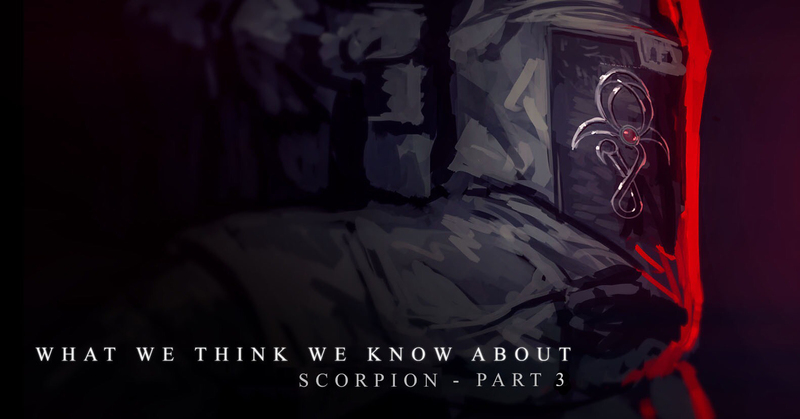 Notable Members: Scorpion’s own leadership reflects the creature from which it takes its name. [Editor’s note; the section about the mythical head of Scorpion has been removed. It was needlessly flowery and therefore does not comply with CapeChaser’s content guidelines, but was left in despite multiple warnings. Additionally, it requires more citations.] Serqet, a villainess who first appeared on the scene in Titan City in the 1930’s, is the Scorpion’s Head, its field leader and public face of the organization, charged with implementing its plans as well as directing Scorpion’s spies and intrigues. It had taken Anthem four days to find out about the situation with Rick Henshaw, editor of the CapeChaser Wiki. At first she’d laughed at the ballsiness of it, and then she’d gotten very, very angry about the ‘endangering a civilian’ aspect of it. After that, it’d taken her another two hours to find Codebreaker so she could ask pertinent and important questions about her role in all this. “Codebreaker. You forged a man’s credentials to get him into a Scorpion base.” It wasn’t phrased as a question. Codebreaker nodded wordlessly. “You’ve put a civilian - retired military or not - in an immense amount of danger.” Codebreaker nodded wordlessly. Anthem gave her fellow Paragon an opportunity to explain her actions while simultaneously fighting down all of the questions she wanted to ask but knew would be counterproductive. She didn’t get Codebreaker in a lot of ways - most people didn’t, and not for lack of trying. She did respect one thing about her, though, and it was something they had in common; they didn’t lie to people, and they didn’t ask anyone to lie to them. In Codebreaker’s case, though, this didn’t necessarily mean she was easy to understand. “He was red,” the smaller heroine said simply. Anthem frowned. Codebreaker didn’t see the world like other people did - or at least, not only like they did. Patterns would express themselves to her as secondary sensory input - colors, scents, or other sensations that only had meaning to her. This allowed the sleuth to figure things out with incredible ease, forming useful and accurate conclusions far faster than other people could. Explaining what she learned to other people was an entirely different matter; most of the sensations she experienced didn’t translate easily. Another nod. “And I think he’s actually safer in Scorpion, under an alias. Bloodwatch won’t look for him there. Not right away. Rick Henshaw - ahem, Rick Martinez, thought the man living under an alias - was watching a video again. This one about helmets and the importance of using them in some ways and not others, if the title of the presentation was to be believed. Although really, everything here was pretty hard to believe. Take for instance the lady on screen; he knew she was Serqet, easily the most public of the Scorpion bigwigs. He also knew that she apparently looked the same now as she had when she’d been photographed in the 1930s. And she looked awfully damn good for a woman pushing at least 150. There’d been a lot of these over the last few days; he’d opted out of the physical training portion by passing a series of tests to measure his ability to run, lift, brawl, and shoot. He’d decided to do optional physical training anyway after passing the various tests by a much narrower margin than he’d liked. This voluntarism had won him kudos from the various instructors, who appreciated his ‘dedication to the cause’. Rick felt no need to point out that the cause he was so dedicated to was keeping his own skin intact; better if they thought he was liking it here, or something. But still and all, passing the tests meant he was on the fast-track, and was being dumped right into learning all about how to function as a minion in a gigantic international terrorist army. Which was, admittedly, part of what he’d come here for. The CapeChaser editor scratched out some notes on his pad while the video played, writing down what he figured to be the important parts, and especially the parts he didn’t think he’d remember. There were a lot of those, as it turned out; he wasn’t used to the sort of thinking that went on here, apparently. He wasn’t used to a lot of things, really. He resisted the urge to scratch the skin around his calf - one of the first things that had happened here was that he had been given a new prosthetic leg to replace the one he’d lost; for the most part it moved and even felt like the real thing, just chrome-plated. It was the sort of super-prosthetic he figured he’d never get, and now that he had it he didn’t really know what to do with it. On the upside, he could crush walnuts between his toes now, in case he ever needed a party trick. He shook his head and resumed focusing on the video presentation. There were two main phases to the ‘learning material’ here. The meat would be the more informational bit; stuff about procedures and duties and what you, as a Scorpion member, would actually be expected to do. However, these would always be sandwiched between segments where a gorgeous brown-haired woman would give a weird sort of pep talk. Rick almost had to admire the job she was doing. If he hadn’t come in here expecting propaganda, he might’ve even missed it, himself. The picture Serqet was painting was paint-by-number; the people she knew were keeping you from being all you could be, the people holding you back, the people she wanted you to resent - they could be anyone. Squint just right and anyone of any creed, color, of any faction from any nation, would slip into the narrative box she had built to give them a home in the heart of every Scorpion recruit. Once housed there the recruit would have someone to hate and resent enough to decide that they needed Scorpion to get back at them, and that would probably keep them there until they came around to being loyal to Scorpion for its own sake. He glanced around at the others. Yeah, most of them were eating it up. The ones who weren’t were the kind that just wanted to do wet-work without having to be freelance, but even they clearly saw the appeal in what they were being told. Either way, it took someone seriously twisted to like what was being said here. Bloodwatch crouched on a rooftop, observing the apartment where his target lived. While waiting for signs of movement, he brooded over his lot in life. This was one of many skills at which Bloodwatch was exceptionally gifted; most of the others involved killing people. The assassin’s intended target seemed to be missing; he hadn’t been home at all in the eight hours he’d been watching. Had he somehow figured out he was being targeted? Would cruel, terrible fate deny him even this? Bloodwatch was probably the world’s best assassin, and it was a field with a surprising amount of competition. He was also the head of the Sting of Scorpion - the part of the organization responsible for eliminating special threats - and Bloodwatch saw special threats everywhere. He knew how to be patient, but something about this bothered him, and so he rose from his crouch to investigate. No sooner had he done so than he became the target of a wave of light that rushed right past where his head would’ve been if he hadn’t seen it coming. He knew that light, he thought bitterly; that blast of jingoistic energy was the signature of his most hated enemy, Anthem. The Paragon collided with Bloodwatch, sword against sword, driving him across the rooftop. He pushed off against her attack and flipped over the alleyway, landing on the next building over. Anthem just sighed. There’d been a time where she would’ve engaged Bloodwatch in banter. There’d been a time where Bloodwatch was, at least nominally, a hero, and she would’ve told him not to lose his way, or at least not do anything stupid. That had all ended years ago, when the man had just given up on heroism altogether and become an assassin. This was one of the things that Anthem really couldn’t stand about the man. And this was one of the other things Anthem really couldn’t stand about Bloodwatch. She was faster than he was, and stronger than he was, but something about his cybernetic enhancements enabled the assassin to focus on multiple things at once. He was able to keep track of her attacks with ease, and worse, he was able to monologue while doing it. “Please stop talking,” Anthem requested through gritted teeth as their weapons locked corps-a-corps. Anthem grabbed an air conditioning unit and swatted her adversary with it. It was big enough that he hadn’t had an opportunity to get out of the way despite seeing it coming. The attack sent her opponent sailing through the air, over the edge of the rooftop. Anthem made a mental note to get her teammate Particle out there to maybe fix the air conditioner so she wouldn’t need to pay for it. She looked over the rooftop’s edge, but the alley below was empty. This was something else she’d learned about Bloodwatch; the second the fight turned against him, he’d vanish, unless he had something to gain from it. And her whole reason for coming here was to convince him he didn’t. Bloodwatch fled down the alley and quickly lost himself in the shadows. He knew this fight wasn’t availing him anything, and as much as he’d like to strike a blow against the hated Anthem, he was smart enough to know a waste of his time when he saw one. He’d come back and look another day. Apparently the Paragons were hiding his quarry from him now? That was interesting, he mused. How’d they find out? Who put the pieces together? But really, none of that mattered; he’d find the target. He had to. Rick Henshaw was the last one.